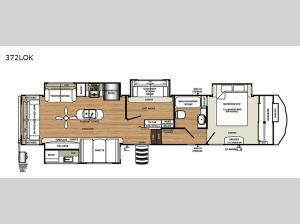 For the family-friendly fifth wheel that you've always wanted, look no further than this Sandpiper by Forest River. You will enjoy the convenience of having two kitchens - one inside and one outside. Almost straight in from the door is the second bedroom which can easily double as a den. Above this room is a loft which features sleeping space for two people. In the combined kitchen and living area there is an island with pendant lights above and extra counter space to make meal prep run smoothly. You can easily relax in this living area with an entertainment center, fireplace, and theater seating!